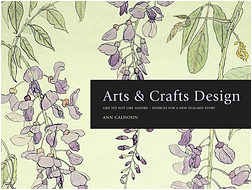 Over decades of privileged study of the Arts & Crafts in New Zealand, I became aware of a body of beautiful designs on paper. Almost all were by women, almost all had never been realised on fabric or wallpaper or on any other media or end product, and most had never been exhibited or published. The purpose of the present study is to right this wrong. This is the story of Arts & Crafts design grounded in the British love of and dedication to nature: the book travels from medieval botanical ­illustration to late nineteenth-century British Arts & Crafts flat nature-based decorative design, an approach taken up in New Zealand using local and imported motifs: from John Gerard’s Herball, 1597 (a William Morris favourite) to Heather Masters’ design, 1933 and Doris Tutill’s embroidery design, based on a wisteria plant, also 1933. A selection of designs is highlighted in colour plates throughout the story. The typical approach to Arts & Crafts design – with nature a constant companion – is summed up in the words of the inspirational Canterbury College School of Art teacher Madame Louise Henderson: “like yet not like nature ... to build structure, yet ­surprise the viewer with the content”. (Madame Louise Henderson’s words on design as told to Heather Masters at the Canterbury College School of Art, New Zealand, early 1930s) – Ann Calhoun. Arts & Crafts Design: "like yet not like" nature: sources for a New Zealand story. Attribution-Non-Commercial-No Derivatives 4.0 New Zealand licence.